KUALA LUMPUR, 17 Dec 2013 – The mathematical sciences are subjects of key global importance, underpinning developments in most areas of science and technology. 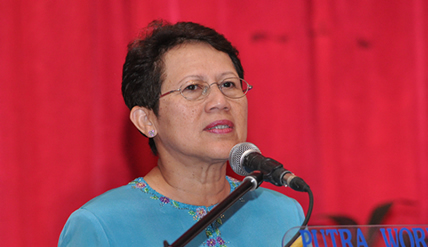 Vice-Chancellor Prof Tan Sri Dato’ Seri Dr Sharifah Hapsah Syed Hasan Shahabudin said the growing concern on the transfer of mathematical sciences knowledge demands the enhancement in the competency of this discipline. Opening the 3rd International Conference on Mathematical Sciences, ICMS3 2013 at a dinner here today, Prof Sharifah Hapsah said applying mathematical sciences to challenging problems of the real world has made the field bustling with excitement and satisfaction. The two-day conference was organised by the the School of Mathematical Sciences, Universiti Kebangsaan Malaysia (UKM) together with the Malaysian Mathematical Sciences Society (PERSAMA). The other universities taking part were the “Lucian Blaga” University of Sibiu, Universitatae Babes-Bolyai, Cluj-Napoca and “1 Decembrie 1918” University Alba Iulia (UAB) from Romania. Prof Sharifah Hapsah called on mathematical academics to forge close links as well as nurture the understanding and collaboration amongst the regional and global scientists and practitioners. She urged academicians, researchers, professionals, students to submit qualified and state-of-art research papers in all aspects of mathematical sciences from basic science to practical applications. Proceedings of ICMS3 will be indexed in ISI/SCOPUS. Among those present at the dinner were the rector of UAB Prof Dr Valer Daniel Breaz, himself a mathematician and researcher,the Dean of the Faculty of Science and Technology UKM, Prof Dr Shahrim Ahmad, the chairman of ICMS 2013 Prof Dr Anuar Mohd Ishak, and PERSAMA president Prof Maslina Darus who is also chairperson of the school of mathematical sciences UKM. Last May, UKM and UAB signed a memorandum of understanding to explore various collaborative efforts including joint conferences, joint researches and supervisions, joint publications, academic staff exchanges and short summer courses.